Caption slip reads: "Photographer: B Gray. Date: 1955-07-11. Reporter: J. Massard. 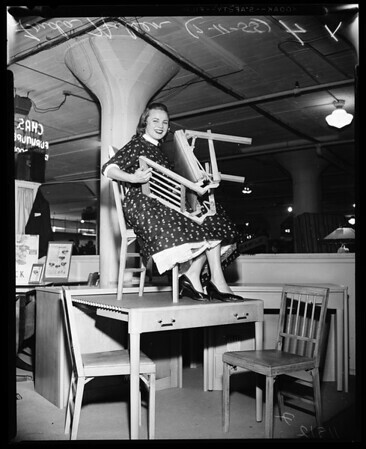 Assignment: Furniture Mart Exhibit. 27 & 28: Patti Fosdick demonstrates silicone-treated fabric which repells ink. 3, 4, & 38: Frida Nilsen sits on table of roll-top dining table which comes in compact bureau with four chairs and linen space. 5 & 6: Beth Crowl and miniature train cocktail table."